If you can't locate the origin of the odor that whiffs by as you pass the kitchen, don't just investigate the usual suspects. That awful aroma you smell emanating from the kitchen may not be the trash can, refrigerator or kitchen sink. The oven can trap errant odors and become a hulking, smelly beast that requires your attention. There are a few quick ways to assess and eradicate bad smells radiating from your oven. There are many reasons bad smells are fanning out from your favorite hot-meal appliance. However, the main culprit is bad maintenance. That funny fish odor didn't arrive uninvited. Grease deposits tend to be the main culprit. Those puddles of forgotten fat find and trap odors in the oven and ferment them over time. Even if you swipe down the oven on occasion, a thin layer of grease can quickly turn into a thick layer of odor-trapping sludge that makes for a smelly oven. Bad oven smells can cling to new foods baked or roasted in the oven, ruining future meals until the issue is confronted and taken care of. There are many cleaning products on the market that attack the ash and grease that build up in the typical kitchen oven. If you cook quite a lot, you may need a serious cleaner. If your oven has a cleaning option, it's still a good idea to clean out the shelving and give the sides of the oven a good scrub before you turn on this option. The cleaning option on an oven basically bakes all the residue off the walls and you are left with piles of ash that need to be cleaned up. To ease that, do a few housekeeping oven cleaning chores first. The wire racks and bottom and sides of the oven need the most attention. Once these are all clean, it is easier to reach in the oven and scrub the ceiling of the oven to get the last bits of residue out. 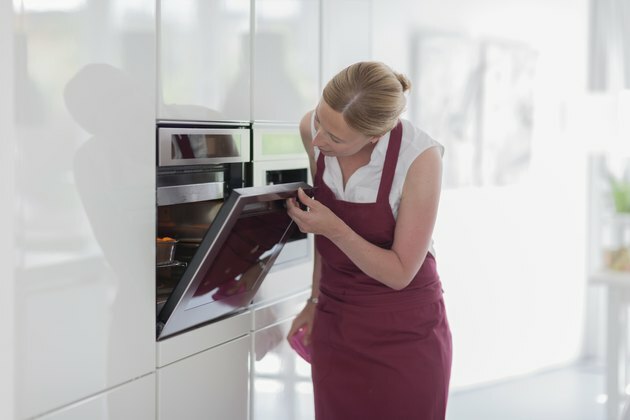 Once the oven is back to its manufacturer and pristine form, there are a few ways to ensure you don't build up new odors in the oven over time. Lay down an inexpensive oven mat on the floor of the oven. Make sure it doesn't cover any vents. This can be easily removed for regular cleaning and is much easier to handle than having to clean the floor of the oven. Cover shelves in aluminum foil when baking pizzas or other items that may gunk up the wires of the oven shelving.